Is there anything more terrifying and/or fascinating than a bee swarm? Nope. Let us count the ways. 1. “The weirdest thing you ever saw.” 20,000 bees invade nice neighborhood, freak out the locals. 2. Bees come out of the closet. Like R. Kelly’s opus, this one comes in parts. 3. Bee experts often show off moves that would be risky for a novice, like sticking your hand into a beehive. But it’s actually not that dangerous, as bees are mostly interested in protecting their hive and their queen. When they leave a hive and swarm, they are by definition not policing any property. Still, don’t stick your hand in a beehive. 4. This isn’t that crazy, per se, but looks like Bear Grylls has an Achilles heel. He’s allergic to bees. 5. One of the weirdest homes for a new bee hive? A car. 6. Never not strange to see people moving bees with their bare hands. 7. First few minutes are just hypnotic. Beeeezzzzzzz…. 8. Okay, it’s a stunt but this MAN is wearing a SUIT made of BEES. 9. Check out 14 second mark, where the bees swarm on a tiny stuffed dog toy! 10. Bee tree meets chainsaw. 11. 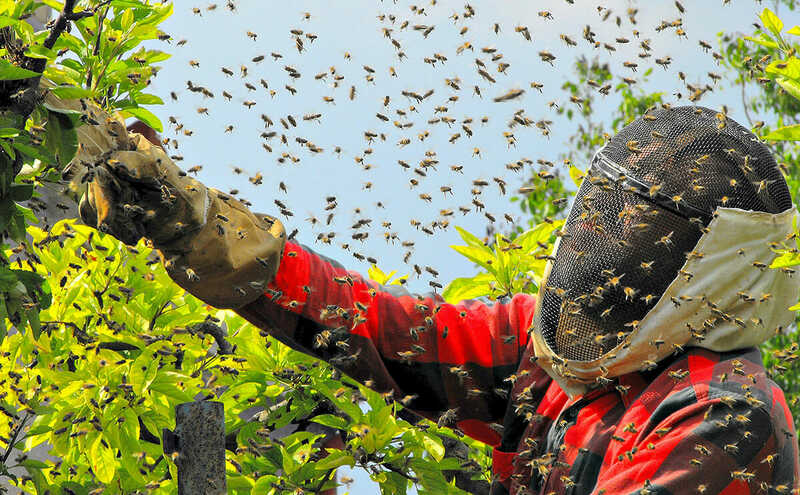 One man removes 30,000 bees from his house. 12. No bee video list would be complete without a nod to Brooklyn’s finest, the Naked Beekeeper. This is part of Modern Farmer’s Bee Week. Click here to see everything from our entire week of coverage all things honeybee. Bee Week: It’s like Shark Week, but with bees.